The first model of the NES wasn�? ?t all that great; just ask any one of the millions of six-year-olds who independently discovered blowing on a cartridge made it work. The second NES hardware revision, the top loader, was better but only had RF video output. These are the only two pieces of hardware that can play every single NES game, and even with years of hacking NES-on-a-chip devices, there�? ?s still much to be desired. [low_budget] over on the AtariAge forum decided he�? ?d had enough of these hardware compromises and decided to build the first new NES hardware revision in 20 years. It�? ?s got all the best features from both of its predecessors and a few new features not seen on any existing NES. There�? ?s support for composite and RGB video generators, new and better amplifiers for the audio, no lockout chip, and a top loading cartridge slot to prevent bent pins on the 72 pin connector. While [low_budget]�? 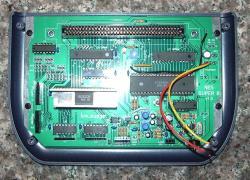 ?s prototype works, it only does so by salvaging the CPU and PPU from a working NES. There�? ?s still much work to be done on the prototype, but even if we�? ?ll have to destroy our beloved NES, we�? ?d love to get our hands on one of these improved consoles. Superbe réalisation cette nes mais je vois que pour le rgb il faut encore un ppu de playchoice 10 décidément elles vont devenir rare . bah sa utilise le PPU standard de la nes donc je pense que pas de RGB !!! put*** il a même fait un boitier !! sauf que il y a bien un ppu de playchoice 10 sur les photo et si tu utilise un ppu de nes c'est du composite. sa c'est peut etre sont truc a lui car il me semble que c'est bien marquer qu'il recycle les CPU et PPU standard ! oui tu peu mettre les deux mais si tu veux du rgb il faut un ppu de playchoice 10. Ce serait quand même sympa que ce projet aboutisse . Je ne connaissais pas le prix ! !